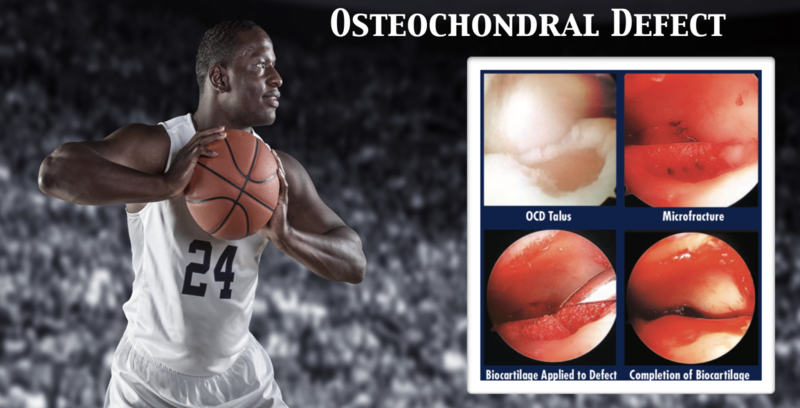 What are osteochondral lesions of the talus? It is an injury to the cartilage and bone in the talus. The talus is the bone that connects the leg and foot. 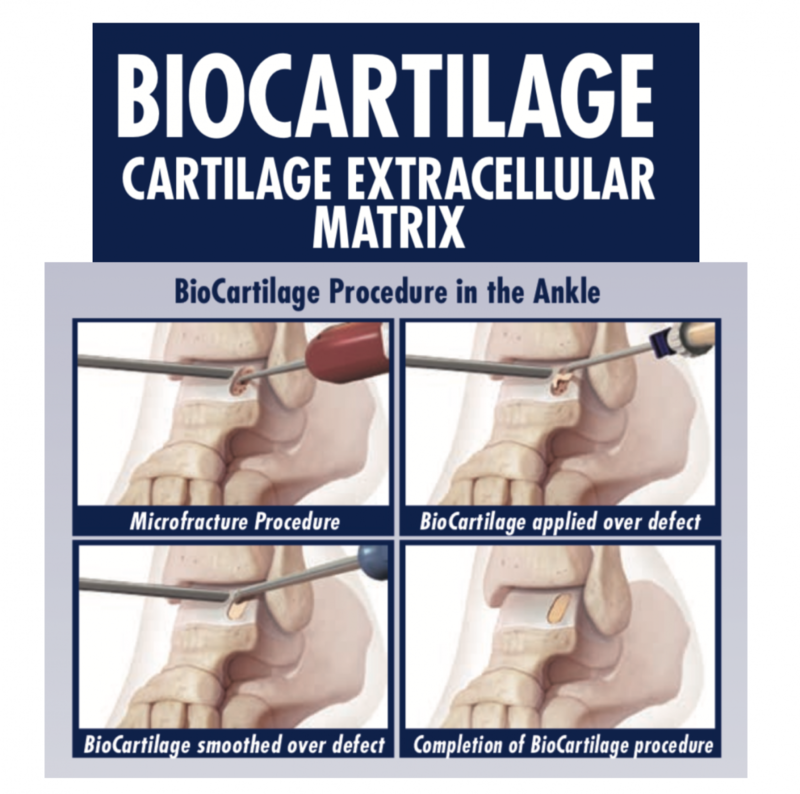 The cartilage in this bone allows the ankle to move freely up and down. Cartilage is the white glistening material at the end of our bones. When the cartilage is uninjured it is firmly adhered to the underlying bone and allows our joints to move smoothly without pain. The cartilage on the talus is between and 1 and 2 mm thick. It is slightly thicker on the inside versus the outside of the ankle. The thicker the cartilage, the more ability the joint has to resist stress. Twisting injuries of the foot and ankle in sports of any kind is the most common way. A fall from a height directly on the ankle with the foot slightly turned down and in or down and out. Osteochondral lesions may be seen in 10-50% of all ankle sprains and are frequently the cause of persistent pain in the ankle. Osteochondral lesions are also frequently seen in ankle fractures of any kind. What are the types of injuries that can occur? 1.Injuries can cause slight bruising of the cartilage in the joints. 2.Injuries can also cause a slight tear in the cartilage. 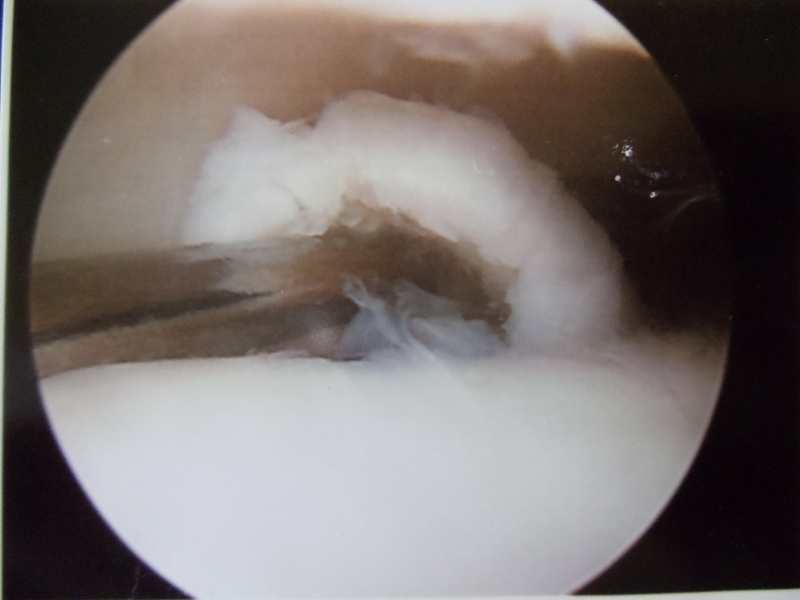 Fluid from the joint may then leak down below the cartilage and go between the cartilage and bone. This can cause cartilage delamination. This means the cartilage begins to lift away from the bone. 3.Injuries can cause a large tear in the cartilage and cause a cartilage flap to develop. This would irritate the joint lining causing inflammation or synovitis. 4.Some injuries will not only affect the cartilage but the bone beneath it. This can cause a bruise or a bone contusion to the bone itself. 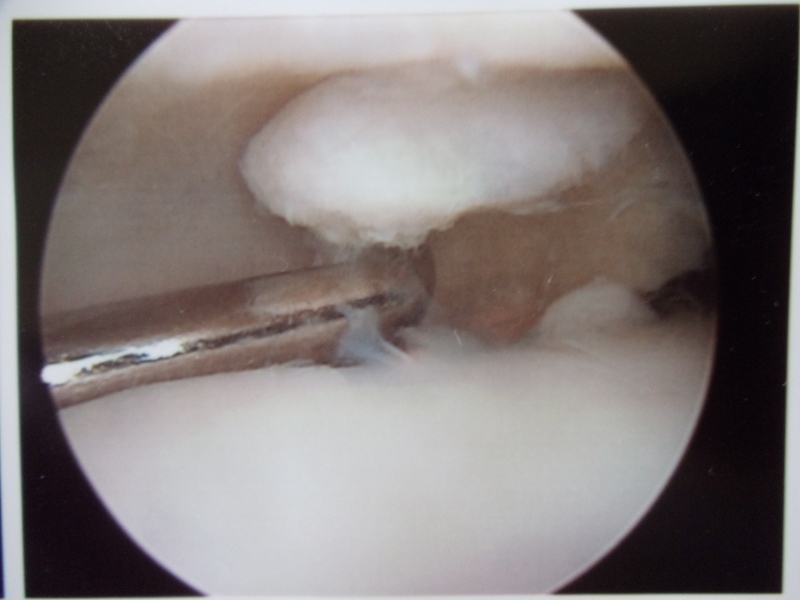 When associated with a cartilage tear, this becomes more problematic. “Berndt Harty I”. 5.A piece of bone and cartilage can be partially broken off but have a stable base. “Berndt Hardy II”. 6.A piece of bone and cartilage can be completely broken off. However, not displaced from its environment or its anatomical place in the bone. “Berndt Hardy III”. 7.A piece of bone and cartilage can be completely broken off and displaced into the ankle joint, causing a severe injury. “Berndt Hardy IV”. What are the signs and symptoms that the patient would experience with this problem? 1.Chronic swelling of the ankle joint. 2.Stiffness in the joint, especially upon getting up from sitting or getting out of bed in the morning. Depending on the injury and the degree of it, stiffness could persist for hours or go away within a few minutes of weightbearing. 3.A feeling of locking when the ankle moves. A click may also be felt. 4.Pain with motion of the ankle joint is significant, not allowing a person to perform general activities, especially sports. 5.A feeling that the ankle is going to give out or twist even if the ankle ligaments are completely intact. How are these injuries classified? 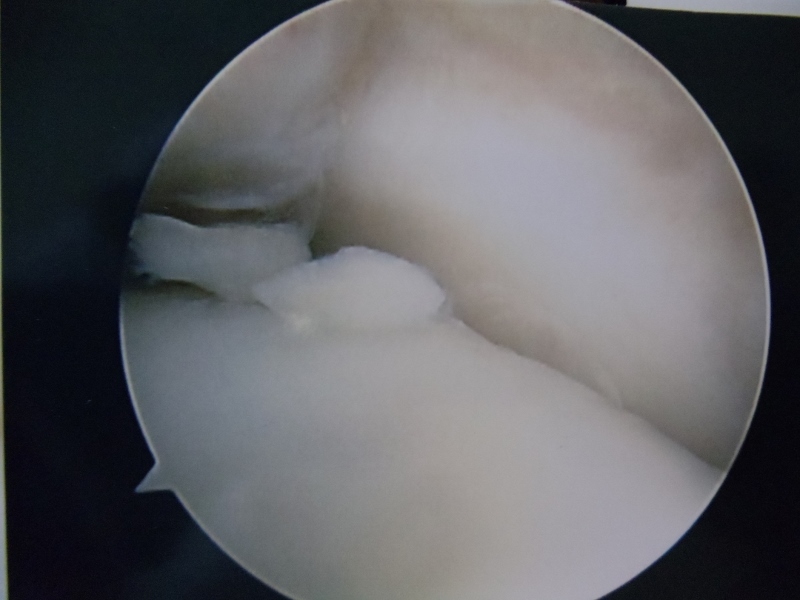 Stage I Small subchondral compression fracture. Stage II Partially detached fragment. Stage III Completely detached fragment without displacement. Stage IV Detached and displaced fracture within the joint. Stage I Subchondral compression/bone bruise appearing as high signal on T2-weighted images. 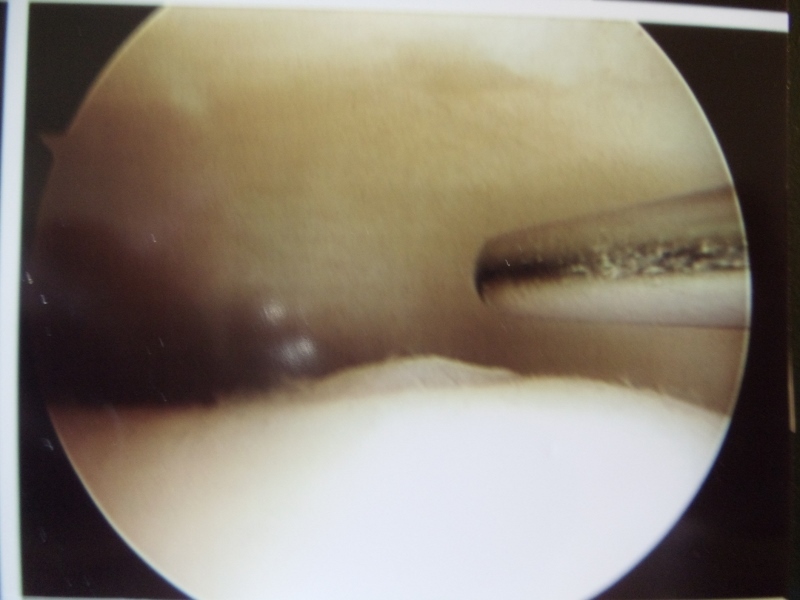 Stage II Subchondral cysts that are not seen acutely (arising from Stage I). Viable (Grade A) or nonviable (Grade B). Stage II (a) Cartilage injury with underlying fracture and surrounding bony edema. Stage III Detached but un displaced fragment. Stage IV Detached and displaced fragment. Stage I Hyper intense but more for logically intact cartilage surface. Stage II Fibrillation or fissures not extending to bone. Stage III Flap present or bone exposed. Stage IV Loose undisplaced fragment.